Kyoto, Nara, Kamakura… when the Japanese culture is a topic of conversation, these names undoubtedly pop up. What is a shared significance between these cities? It is Buddhism. According to The Chronicle of Japan, the second oldest history book complied around A.C. 720 under the order of the crown prince at that time stated that Buddhism was brought to Japan through the Kingdom of Baekje, located in the Korean peninsula in A.C. 538. Notably the idolatry of Buddhism was widely supported and enhanced by not only the imperial family, but also the regional baronial clans throughout Japan as Buddhism infiltrated into the county. We can still find the vibrant but sophisticated Buddhist structures, paintings, tapestries and sculptures in every city, town, and village in the county. This is not an overstatement. The Asuka Period (AC 592- 710) signifies the existence of Hellenism influence via the Sui Dynasty in China and Koguryo in the Korean Peninsula. We can see the caucasian features on the faces of the statutes, which assures a terminal of the Silk Road was the country of the rising sun, Japan. Buddhist arts continued to flourish throughout the Nara and Heian Period (AC 710-1185). The main players of the Buddhist culture were of course the priests and monks, but most importantly, the patrons from the royal family and the surrounding powerful clans who often made contributions to build the structures and statutes to ease the famine and plague of the time. After the strong imperial government shifted to a reign of Samurai worriers, Buddhist culture began showing different faces during the Kamakura Period (AC 1185-1333). It is easy to imagine that people sought a mental reprieve under the battles and violence. 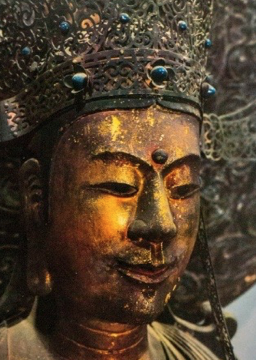 There were many schools of Buddhist artists during the period who actively produced a variety of Buddhist art. Among them, our focus today is Unkei, a sculptor from Kei School. His masterpieces still attract people in Japan and around the world. Unkei is probably the first sculptor whose name was engraved and recognized as a maker of masterpieces. Only 31 of his sculptures are said to be remaining, mimicking muscular and realistic figures, especially in his later career. Although some researchers deny the theory, it is natural to understand that Unkei’s style was a preference of the era, which was the Samurai’s domain. When you look closely at the proportion of some of the figures, they are anatomically incorrect; some have longer torsos or unrealistic muscle structures. Strangely, the technique gives the sculptures lifelike and defined appearances. After nearly 1,000 years, in your imagination, the sculptures seem to talk to you, scare you, and comfort you with their compelling eyes with crystal inlays. Because the wood from these pieces of art was used to build most of the Buddhist halls, many of them were destroyed by fire, natural causes, or during battles. Today, his remaining works are spread around Japan, but some are not available to the public. 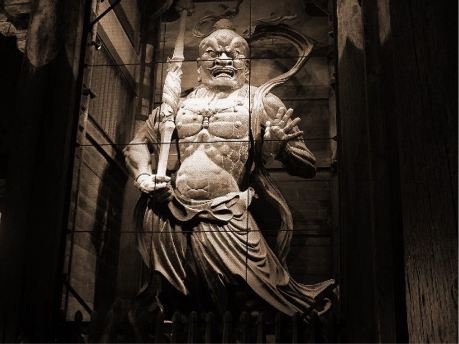 Many of his notable figures, however, are found at Todaiji and Kofukuji in Nara, Japan. Modern technology can now reveal the internal details of Unkei’s work. A crystal ball was found in one of the sculptures by a CT scanner. This exceptional artist brings life to his work secretly and invisibly. It is, needless to say, worth traveling 6,000 miles to see his works. Japan, with a history of over 2,000, has vast range of art and literary works. Thus, this country keeps fascinating many scholars, tourists, and the locals who live here, like myself, and it does not require any prerequisites for the encounter. The art pieces are made for people, just like any of us who feel and sense the meaning of their existence. The long history of preservation proves how much the people in this country cherish their traditions and past.